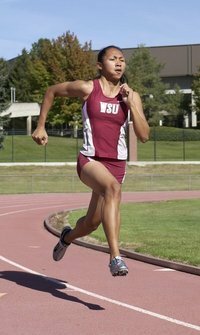 Perhaps the best chance for the Fil Foreign athletics team is Princess Joy Griffey of Washington State University. The speedy Filipina was born in Bacolod in 1987 and spent her child hood in Paglaum Village nearby aswell as many other villages, she is a second generation sprinter. Her mother Leah Nolido was a 12.3et 100m runner (ran 11.9ht) and represented the Philippines in the Asian Youth and ASEAN School Games. Nolido used to run against Lydia De Vega Mercado. 23 year old Griffey who stands at 5’4, unofficially holds the Philippine Junior Record having recorded 11.75s as a 17 year old at the US Junior Olympics in 2004 and placed 3rd! (which is faster than the 11.76s time recorded by Lydia at the Asian Games 1982 in New Delhi). Princess Joy is second on the all time list behind Lydia with a personal best of 11.58 seconds. She is currently the fastest Filipina in the world with an 11.65 second run in 2010. She consistently runs sub 12 seconds electronic for the 100m, and never has a time in the 12 second range. Her 200m is 24.00 officially but she has ran a wind aided 23.90 and also timed 55.96 for the 400m. Griffey is intending to race at the Philippine National Open this year and the grand prix series in a build up to SEA Games. Her times in the 100 and 200 from last season would see her place silver and bronze in those events behind Vu Thi Thuong of Vietnam (the 2005, 2007, 2009 100m Champion at SEA Games). She is a vital cog for the Womens 4×100 and 4×400 team at SEA Games having split 53.5 in a 4×4 relay before. For Philippine Athletics her presence is sure to help give a wakeup call to womens track and field in Philippine Track and Field with the last athlete to win a medal at the SEA Games in the 100 was a bronze from the now retired Lerma Buluitan Gabito (specialist long jumper). I caught up with Princess Joy Griffey on Facebook, the down to earth sprinter is very passionate about the sport and very proud to be part of a great sporting legacy. what your studying and perhaps your plans after you graduate? PJ: Washington State University is located in Pullman, WA. Its a really small town and its mostly farm lands. I majored in Criminal Justice and minored in Political Science and Sociology. I took up Criminal Justice because I enjoy reading about laws and criminal theories and etc. After I graduate I want to work for the federal government but I want to run for the Philippines first. PJ: start competing from January to June. Indoor tracks are somewhat difficult to run on. Some tracks can only be 200m long, either flat or banked. Some are 300m long and only flat. One bad thing is that long distance runs feels like forever. But the good things are: I would race 60m only instead of 100m and its inside so there is no complaining about the weather..
PA: Could you tell us about how a typical training week would go? PJ: I have a new training program after I left college. I would usually run 6 times a week and lift 3 times a week. Monday, Wednesday, and Saturday are mostly long sprint run and some days are short sprints. Tuesdays and Fridays are like my recovery runs. Right now its difficult because my coach is in California and I’m in Washington but its not a problem. The only thing is to work on my technique. .
PA: Next question I guess is in regards to nutrition and recovery Do you have a special diet? or do you just eat whatever? do you take supplements? if so which ones? PJ: Well…I eat a lot of rice. haha. I actually eat whatever that is healthy. I don’t really have a special diet, like a routine. I take vitamins and usually drink chocolate milk after workouts. On weekends I try to get junked foods..
PA: By Chocolate milk do you mean whey protein? PJ: lol i used to drink this gatorade recovery drinks and it had the same stuff as chocolate milkin our weightroom they give us chocolate milk. PA: I heard you are very fond of Filipino food in particular Lumpia? PJ: lol yeah. I go crazy for them. I like Puchero. PA: I guess you will feel right at home in the Philippines then. PA: Ok next these are the questions from Yell Carreon the Pinoy Miler himself which he gave me to ask. PA: Among your medals so far, what’s the one closest to your heart? PJ: ok hmmm that one is difficult. PJ: I think my first state championship medal in High School. I was only a sphomore competting with seniors. That win told me I could be good and hopefully take it to the next level..
PA: Who are your greatest influence in Athletics? PA: What prompted you to take up the sports? PJ: When I saw the 1996 Olympics and when my teacher in elementary school asked me to run for the school. Also, I think it was in my blood. My mom ran for the Philippines and i want to follow in her footsteps. PA: What’s your personal goal as far as athletics is concerned? It can be a PR mark, medal or title. PJ: Hopefully win a Philippine National championship and place at SEA Games. PA: Ok PJ thanks very much for your time and all the best in your leadup to the National Open. Maybe the team of pinoymiler will catch up with you then. Ladies and gentlemen Princess Joy Griffey!